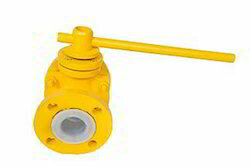 We are engaged in offering a wide range of Lined Valves. Under the offered range, we have Lined Ball Valves, Lined NRV Valves, Lined Plug Valves and NRV Lined Valves. 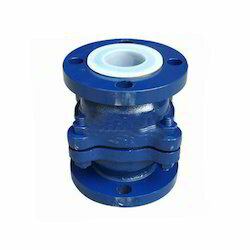 We manufacture the offered Lined Valves by utilizing best grade raw material, sourced from the reliable vendors so as to ensure their sturdiness and reliable performance. Size 25 NB to 80 NB. Our organization is engaged in offering PTFE Lined Ball Valves as per the details given by patrons. Offered ball valves are widely demanded as these are designed in accordance with the ASTM standards and have a ductile iron body. Along with this, these ball valves make use of the full port design for lowering pressure losses, rising the flow capacities and gives optimum product hold up due to their cavity filled seats. Size: 25 NB to 80 NB. Flange connection: ANSI B 16.5. We are offering a wide range of Lined NRV Valves, which is manufactured in-line with set ASTM standards. The liquid is passed in offered valves when the solid PTFE ball gets pushed back under normal flow. Further, when the ball gets back in original position in backward flow the movement of liquid is stopped via process contamination. Moreover, these valves have PFA liner locked by multiple locking grooves in the housing with T slots ensure their resistance against rust. 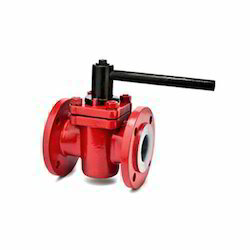 We are offers Lined Plug Valves, which is resistant against rust and is durable. With an aim to ensure the same, we manufacture these plug valves by making use of best grade raw material, sourced from the authentic vendors. We provide these plug valves in minimum lining thickness of 3 mm.